Written by Anne Collins Goodyear and Paul B. Jaskot. This summer four institutes held on the east and west coasts provided opportunities for art historians—both academics and museum professionals—to increase their familiarity with the tools and opportunities presented by a computational approach to “doing” art history. These programs, underwritten by the Getty and Samuel H. Kress Foundations took place at Harvard’s metaLAB (Beautiful Data: Telling Stories About Art with Open Collections, June 16–27, Getty Foundation), George Mason University’s Roy Rosenzweig Center for History and New Media (Rebuilding the Portfolio: DH for Art Historians, July 7–18, Getty Foundation), UCLA’s Digital Humanities Program (Beyond the Digitized Library, July 28–August 6, Getty Foundation), and Middlebury College (Summer Institute on Digital Mapping and Art History, August 3–15, Kress Foundation). The firm groundwork laid by these programs as well as the enthusiastic response by participants suggest that the field of art history is in an ever-stronger position to take advantage of the opportunities provided by new technologies and to lead the digital humanities in key areas. Each program had its own personality and addressed different needs in the field. At Harvard, attendees found themselves working on digital archival collections and exploring different approaches to using this kind of information, such as curating, annotating, and visualizing digital collections. The institute at George Mason provided self-identified newcomers to digital scholarship with broad exposure to digital environments and specific tools, including the use of social media, data mining, and visualization techniques. UCLA organizers focused on methodological and theoretical issues at stake in the digital humanities and encouraged participants to critically address their approaches. A one-day conference on publishing and the digital environment at UCLA allowed participants and audience members a chance to reflect on participant’s projects and the future of digital scholarship. For the Kress mapping institute, fellows were asked to come prepared with specific spatial questions related to their area of research and to include a database of spatial information. In the short period of the workshop, they were exposed to the methods of digital mapping through Geographic Information Systems (GIS) and, on the last day, presented extraordinary maps of their own that pushed their research questions forward. Collectively, the summer institutes show the diversity of approaches as well as the depth of interest in digital scholarship, something unusual for any humanities field in recent years. 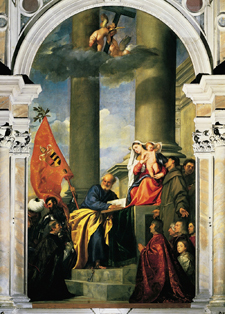 Digital or computational art history has been gaining ground since the advent of innovative projects like the Digital Roman Forum and Mapping Gothic France, among others. Work in our discipline has been further sustained by new publishing venues for digital work. These include not only new authoring and publishing platforms such as HyperCities and Scalar, but also more substantial interventions in long-standing print periodicals, such as the Journal of Society of Architectural Historians online edition, which allows authors to include a variety of digital formats with their texts. Indeed, CAA’s adoption of an electronic format for its print journals earlier this year through its partnership with Taylor & Francis continues the important role of facilitating new sorts of scholarly publishing. More important, however, are the new forms of analysis and data sharing that digital art history makes possible or, alternatively, the ways in which digital methods push known scholarly questions in innovative and exciting directions. Addressing the “stuff” of art history from a computational standpoint may initially seem counter-intuitive, particularly given the field’s propensity for qualitative analysis and the stress placed on our ability to look closely. However, reflection upon the nature of the information we might encounter, particularly in the era of “big data,” suggests how rapidly the field might benefit from alternatives to traditional research methods. Depending on the nature of the art-historical problem, such analysis may involve the identification of trends in bodies of literature: the use of certain key terms for example, and their frequency. It may enable us to identify economic, social, or stylistic relationships between key entities through network analysis. It may utilize tools to analyze more minutely geographic settings and the relationships between buildings and human actors, or to study the physical evolution of sites over time. Each of the summer institutes took a different approach to these possibilities, with some offering a wide view while others provided a more focused set of inquiries. Tweets from the UCLA colloquium and the individual workshops have been gathered at #doingdah14. While the summer institutes show the energy around the digital humanities in art history, CAA has also been continuing its strong investment in responding to member interest in this area. For example, in addition to hosting its third annual THAT (The Humanities And Technology) Camp, CAA will offer a number of digital humanities workshops at the upcoming CAA Annual Conference in February in order to meet the needs of both artists and art historians. These include: Building Scholarly Digital Archives and Exhibits with Omeka; Scalar; and Making Sense of Digital Images, which explores how to describe and develop optimal reproductions, both for current projects and for preservation. Furthermore, CAA is now examining the question of tenure and promotion based on projects using digital tools. In our reading of the field, the digital future of art-historical scholarship rests in part, and for the near future, on its acceptance by those responsible for evaluating tenure and promotion applications. Since 1973, CAA has formulated and published standards and guidelines on its website after careful research and ratification by its Board of Directors, thereby offering guidance to arts institutions as they create policies and make decisions. In a 2005 addendum to CAA’s current guidelines concerning tenure, the Association recognized “that the well-documented “crisis” in scholarly publishing in the humanities is especially acute for art historians, and threatens the integrity and continuity of the discipline if colleges and universities continue to insist on books as the chief criterion for tenure and promotion.” This concern grows larger with the development of new forms of digital publishing. Other scholarly societies have developed or are investigating guidelines, including the Modern Language Association and the American Historical Association. Professional literature also addresses the need and components for useful guidelines in The Journal of Digital Humanities, society reports, and in compendiums such as Debates in the Digital Humanities, edited by Matthew Gold (University of Minnesota Press, 2012), Digital­­_Humanities, by Peter Lunenfeld, Anne Burdick, Johanna Drucker, Todd Presner, and Jeffrey Schnapp (Cambridge, MA: MIT Press, 2012). Additionally, NEH-funded workshops have addressed the need for guidelines, including an institute sponsored by NINES. These initial efforts to promulgate advancement and tenure guidelines serve as models for other humanities disciplines. An equally crucial question facing the field is the sustainability of digital scholarship, particularly in light of the rapid development of new technologies. Rather than allowing such scholarship to “sit on the shelf,” digital work must be networked in order to survive. The question of the interoperability of the programs utilized for scholarship aside, technology platforms become outmoded and CD-ROMs, disks, and external drives will inevitably deteriorate. The field would benefit from the development of “best practices” for the creation of digital scholarship, from mechanisms of data storage and retrieval, to the development of trustworthy digital repositories, and a careful analysis of the benefit of open-source versus proprietary software for particular forms of writing and data analysis. In addition, funding institutions need to consider the need for further training, like the four summer institutes, to assess what works and what doesn’t for the long-term sustenance of new scholarly innovation. Despite these challenges, which may, in fact be invitations for future collaborations among art historians and across disciplines, the realm of the digital offers exciting new possibilities. Perhaps most significantly, digital scholarship may demonstrate the significance of some of the skills we tend to take for granted as humanists and experts in visual analysis: namely the ability to think critically about the function and production of images and language, as well as the source of these representations. Just what assumptions may be embedded in the very way we interact with the digital realm and how might we tease that apart? Digital art history, then, permits not only a new way for us to interrogate our data and our own assumptions, but for the very visualization of both traditional archival information as well as the digital itself to be rethought. Anne Collins Goodyear, Co-Director of the Bowdoin College Museum of Art, is now CAA Past President. She served as president of CAA from 2012 to 2014. Paul B. Jaskot is currently Andrew W. Mellon Professor at the Center for Advanced Studies in the Visual Arts (CASVA), Washington, DC (2014–16). He served as CAA’s president from 2008 to 2010. We thank Anne Helmreich for sharing her thoughts on the resources developing in this arena. We are writing to ask for your insights regarding practices in new media by taking the following survey: http://bit.ly/CAAsurvey – this should take approximately 20 minutes for you to complete. The information gathered from this survey will be used to assist the CAA Professional Practices Committee Taskforce on updating and improving the existing CAA Guidelines for Faculty Teaching in New Media, which can be found at http://www.collegeart.org/guidelines/newmedia07. This document is a description of circumstances, standards, and practices within the field. Its purpose is to assist with faculty hiring, promotion and tenure, workload, compensation, funding, and support in new media, and to provide information about faculty working in this area that could be used in making accurate and comprehensive evaluations. Our aim is to revise these guidelines into order to the better reflect current practices, and to ensure that it is a useful document for all stakeholders. In February 2015 we will be making initial recommendations for revision, based on this survey and interviews with those in the field. Our goal is to have the updated document(s) approved by the CAA Board by May 2016. If you are interested in being interviewed by our committee members, please contact us at caanewmediataskforce@gmail.com. In addition, we ask that you forward this email to your colleagues, whose input is valuable. In addition to New Media Faculty, we would especially like to involve colleagues with administrative duties overseeing practitioners who work with new media as well as part-time and contingent faculty in this survey. The survey will end on November 15, 2014. We thank you for your time, and look forward to your input. The following announcement was originally published by Ithaka S+R on April 30, 2014. 1. The emergence of “digital art history,” and how it is diverging from the broader understanding of the digital humanities. 2. 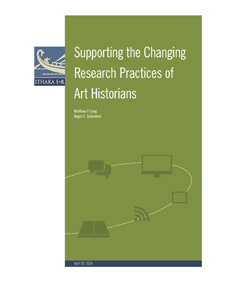 The interconnected scholarly communities that support art history, including museums, libraries, and visual-resources centers, both within and beyond an art historian’s home institution. 3. The changes that digitization and online search portals have brought to the process of searching for primary sources and the limitations of the current discovery environment. 4. The practices art historians employ for managing their large personal collections of digital images. 5. The state of graduate students’ professional training. Within these five areas, the report makes clear that the needs of art historians can be successfully met only through the collaborative work of many support organizations. Our findings suggest several opportunities for these organizations to develop new funding, services, tools, and initiatives that will have far-reaching impact on the discipline. This is the third project to be completed as part of Ithaka S+R’s Research Support Services Program. A report for the project in history was released in December 2012, and a report for the project in chemistry was released in February 2013. Help us collectively record an audiobook of Joe Berry’s Reclaiming the Ivory Tower!! Call for Introduction, Chapter 1, & Chapter 2! Adjunct Underground, a radio program dedicated to the issues confronting today’s contingent educational workforce, is looking for any current or former adjunct/contingent/part-time faculty who would be willing to read and record short sections of Joe Berry’s book, Reclaiming the Ivory Tower: Organizing Adjuncts to Change Higher Education. Our goal is to create a complete audio book of Berry’s book, read entirely by a plethora of adjunct voices. Are you an adjunct or contingent teacher, and would you be willing to read aloud and record a few pages for us? The resulting audiobook will be broadcast one chapter at a time, and made available as a free, downloadable podcast, on the program, Adjunct Underground, on KCHUNG Radio. All contributors can remain anonymous if they so choose, though no voices will be altered in the recordings. If interested, please look at the spreadsheet at the following link, and select and mark an available section that you would like to read: https://docs.google.com/spreadsheet/ccc?key=0AnRu6M-k0cvidEVNUktzUGtBUUlDRFJQNHZKYzEtYkE#gid=0. We would like to get as many voices as possible to read this text, so for now we are accepting only ONE section per person. Finally, please help spread the word by recruiting at least one colleague of yours to participate as well! Reclaiming the Ivory Tower is the first organizing handbook for contingent faculty—the thousands of non-tenure track college teachers who love their work but hate their jobs. It examines the situation of adjunct professors in U.S. higher education today and puts forward an agenda around which they can mobilize to transform their jobs and their institutions. Full of concrete suggestions for action and based on extensive interviews with organizers Reclaiming the Ivory Tower is the most comprehensive and engaged account to date of the possibilities for a movement that has important lessons for labor organizing in general, as well as for the future of higher education. Joe Berry teaches labor education and history at the University of Illinois and Roosevelt University in Chicago and chairs the Chicago Coalition of Contingent Academic Labor. Adjunct Underground is a KCHUNG Radio broadcast and movement dedicated to the trials and tribulations of adjunct instructors in Los Angeles, and throughout the universe! Our sporadic underground broadcasts feature stories, conversations, interviews, rants, and more from our bunker-full of adjunct DJs and hosts, many of whom risk their livelihoods meeting with us to share their stories and insight on the precarity of today’s contingent education professionals! Adjuncts unite! Underground! on KCHUNG Radio! CAA invites members to participate in a digital media art preservation project currently underway at Cornell University in Ithaca, New York. This project aims to develop scalable preservation strategies for complex, interactive, born-digital media artworks using the collections of Cornell’s Rose Goldsen Archive of New Media Art as a test bed. In developing a preservation framework that will address the needs of the broadest range of archive users, Cornell seeks the input of artists, researchers, educators, curators, and others who work with interactive digital artworks and artifacts. Would you please take a few minutes to respond to this questionnaire about your practices? Depending on your responses, the survey should take approximately ten to twenty-five minutes to complete. Information about questionnaire results will be published and made available to the broader media archives community. Read more about this preservation initiative here or contact Madeleine Casad, associate curator and Rose Goldsen Archive of New Media Art Curator for Digital Scholarship for the Cornell University Library, for more information. Registration is now open for THATCamp CAA, a free “unconference” on digital art history that is taking place during the week of the 2014 Annual Conference in Chicago. THATCamp CAA is open to scholars, artists, and graduate students with an active interest in digital art history, defined as scholarship and education in art history, architectural history, and archaeology that is supported by digital technology. The 2014 event will build on the great work done at CAA’s THATCamp in New York in 2013. Full details of the upcoming event, including information on how to register online, can be found in the About section of THATCamp’s website. THATCamp CAA will be held at Columbia College Chicago on the days immediately preceding the main conference: Monday, February 10 (11:45 AM–5:15 PM); and Tuesday, February 11 (9:30 AM–5:00 PM). A follow-up session intended to reflect on the discussion is scheduled for Thursday, February 13 (9:30 AM–NOON) in the Marquette Room of the Hilton Chicago. Participants should be able to attend all sessions. Registration is now open! The organizers also ask that you begin proposing session ideas. Approximately sixty participants will be accepted on a first-come, first-served basis. Space is limited. Only those who can commit to attending all days should register.